In today’s world of fashion, it seems like anything goes at weddings. If you just browse the internet you will find that there are so many unusual and totally cool themes for wedding attire that you have unlimited choices in how you want to dress. When it comes to unique wedding outfit ideas for kids, those should always follow the theme of the bridal party. Even kids who aren’t part of the actual wedding party love to dress for weddings, so if you are planning a special theme, let the kids go in style as well. They are people too – just in little packages! Outdoor weddings have captured the nation and more and more couples are pledging their troth in parks, at the seashore and in gardens around the country. Many times they choose a theme conducive to the venue and why Country Western weddings are all the rage. Even if the bridal party is not dressed in western attire, little ones love to dress like cowboys and cowgirls and why it is so cute to see little ladies dressed in toddler girl cowboy boots. When the wedding dances start, can you just imagine them clogging? 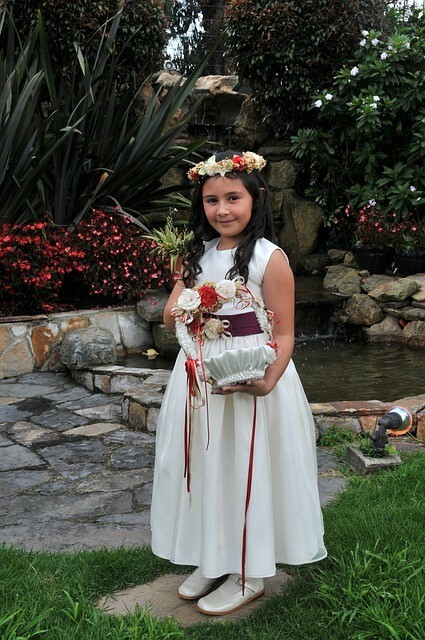 Little girls always love to dress like a princess and what better time than at a wedding? There are so many cute costumes available, complete with crowns and tiaras that you will never lack for inspiration when dressing your little one as a princess mini-bride. Little boys love to wear costumes as well, so why not let them dress as Prince Charming? Whether they are to act as ring bearer and flower girl or just going to attend as guests, they will get a kick out of going as fairytale characters and you may even find that they act better as well. After all, you can remind them that prince and princesses don’t show their tempers at weddings! Okay, so it’s not a costume ball but to little ones it is! They see the bride and groom decked out in all their splendor and feel that they should be dressing up as well. Of course you will need to tone it down a bit so as to not make a spectacle of them, but why not let them semi-dress as superheroes? If a groom can wear a long-tail tux, why can’t a little guy come in a mini-tux with a batman-like cape? It’s all in how you design the ‘look’ that will satisfy little people but appease grownups at the same time. Make it fun for the kids and they’ll not be asking to go home before the evening is over. Remember, weddings can go on and on and if you want to stay around for the celebration afterwards, you need to do something creative to keep the kids’ interest. Costumes are the ideal solution because you can continually draw their attention back to the ‘role’ they are playing, thereby distracting them as the need arises. Princesses and fairies act like little ladies so a little one dressing the part can be gently reminded to act the part. Besides, how cute is that?